There are three ways to see wildlife: start hiking and hope that you become lucky, try to follow the tracks that you found during your hike or try to understand the story behind the tracks. Don't think that tracks are limited to deer, moose, fox, dogs and the rest of the animals that come to mind when tracks are mentioned. Ants, turtles, snakes, birds and a whole assortment of reptiles and insects leave tracks, too. The information below is dedicated to the mammals, reptiles and birds. OTG Wildlife Tracking doesn't necessarily mean seeing physical tracks. It is also an awareness that a OTG Wildlife Photography opportunity exists without ever having seeing any tracks. Both methods are explained below. 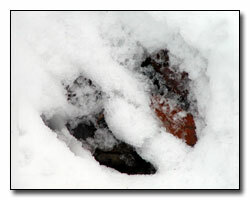 By understanding tracking concepts, you will become more aware of more wildlife, even if you can't identify the tracks. Most of us see wildlife from the opposite perspective. They are either running or flying in the opposite direction of where we are standing. And that certainly does not allow for OTG Wildlife Photography opportunities. So, why do we see such great photographs of wildlife in magazines that we could only dream of seeing? You might want to start by reading "Understanding The Language Of The Birds" for helpful instructions on how to recognize that wildlife may be near you. If you know that wildlife is present, at least there is a possibility that you won't scare wildlife away. The article on learning how to use your five senses in "Learning To See With Outdoor Eyes" will also help you become aware of the presence of wildlife. Tracking is a difficult skill to acquire. It has to be mastered, practiced and, even when you think that you're making some progress, you start doubting your ability. So, why is tracking even being mentioned in OTG Photography? Well, the more you know about wildlife, the better chance you will have in seeing and photographing wildlife. I don't expect you ever to become a Daniel Boone; but, with some basic knowledge of tracking, you will become a better wildlife photographer. 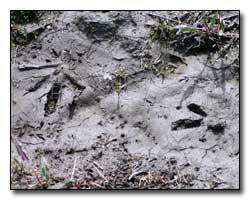 OTG Wildlife Tracking is referred to as tracks in snow, tracks in mud and tracks in sand. These are the easiest to see, even if you can't recognize what type of wildlife made them. In any situation, don't think that you have to know the answer to all of the questions below. As long as you ask yourself questions, the process will be rewarded. The following are the six elements of tracking. 1. What Wildlife Can I See? This is the most important element. If you don't know what wildlife you could see during your hike, then you will never be able to ask questions. Study a Peterson Guide, a Sibley Guide, a park brochure, the Internet or any other resource that will help you know what wildlife you could see in your area. For instance, if the chipmunk goes into hibernation at the end of November, there is no chance that you are going to see a chipmunk in January. By knowing what wildlife you can see and what wildlife you can not see allows you to make better decisions on how to discover wildlife. If you know that a Red-Tailed Hawk has juveniles to feed during this time of year, position yourself near an area that there is an opportunity to photograph a Red-Tailed Hawk catching food. Tracking in this situation is the knowledge that you have to put yourself in the best situation to have an OTG Photography opportunity. 2. Who Made The Tracks? What type of animal made these tracks? There are numerous pocket guides available for resources in identifying tracks. The Peterson Animal Tracks guide book is one of the most complete guides available. 3. What Was The Animal Doing When The Tracks Were Made? Was the animal chasing another animal or hunting another animal? Was the animal walking or looking for a place to sleep? 4. When Were The Tracks Made? By identifying when the tracks were made, maybe you can come back tomorrow at the time you think the animal comes by. If you are hiking at 10:00 after a snow storm that ending in the early morning and you can see well-defined tracks, you know that the animal had to come by between early morning and 10:00. If the animal came by earlier in the morning, the snow still falling would have covered up the tracks. So, you might decide to come by at dawn the next day and wait. Maybe you will have an OTG Wildlife Photography opportunity. 5. Where Did The Animal Go From Here? Is it just passing through? Did it go to sleep near by? Sometimes, by following deer tracks for a short distance, you will find where the animal slept during the night. 6. Why Did The Animal Go Though Here? Why does the animal move at a specific time of day? Is this a pattern for this animal? Will it come by tomorrow and use this same path? Deer have roads and highways through the woods that they constantly use. You decide to take a 2 mile walk on a beach that you never have been on before. It is 9:00 in the morning. During the hour and a half walk down to the end of the beach, you were disappointed since you didn't see too many birds. You noticed that the tide was coming in by the texture of the sand, since the top of the highest water mark was dry sand. Had the top of the water mark been wet, you would have known that the tide was going out. About 1 mile into the walk, you noticed that there's a small sand bar off the beach that was being covered by the incoming tide. If you had arrived 15 minutes later, you probably wouldn't have seen the sand bar as it would be completely under water. Then, you noticed numerous shore bird tracks on the sand bar. The most important element of tracking in this example is element number 4. The answer to the question of "When were the tracks made?" is rather simple. They were made after the last high tide. You know that tide will be approximately 1 hour later tomorrow. So, if you start your walk at about 7:00 (which is 3 hours before today - 2 hours earlier and 1 hour for the tide change), there is an excellent chance that you will have an OTG Wildlife Photography opportunity. If you have a digital camera, take some photographs of the tracks and maybe you will be able to identify the birds. If you identify the tracks as Seagull tracks, maybe you ought to consider a different beach to walk on tomorrow. As long as you become more aware and ask simple questions about the tracks, you will see more wildlife in their natural state instead of seeing them running or flying away. "Where And How To Look For Wildlife" will help you become aware of the presence of wildlife as well as the article about "The Effect Of Weather And Seasonal Change".